USGolfJobs.com provides golf job seekers and industry professionals with undisputedly the largest database of golf jobs and employment opportunities available anywhere. USGolfJobs.com has been featured in publications like Golf Magazine, Golf Digest, Golf Inc., as well as other top industry books, magazines, and resources published such as "An Insiders Guide to Careers In The Golf Industry" published by the Natioanl Golf Foundation. USGolfJobs.com works with many golf organizations, academic institutions, specialty colleges, teaching programs, and their graduates. USGolfJobs.com is so much more then just a list of golf jobs. As a job seeker, you will have access to the largest database of golf jobs and golf employers found on the web, insightful career advice, the latest industry news and articles, resume writing and interviewing help, a resume creation wizard with your own personal web space to display it, and much more! How do I get started? Three easy steps. We put you in DIRECT CONTACT with golf employers. It's that simple. By Golf Industry Professionals, Making It 11 Years In A Row! Q: Can you help me with my resume? A: Yes. Depending on the contact information provided by the employer, there are any number of ways you can apply to jobs. We also provide a resume wizard that can build a resume for you by having you answer some simple questions, and send this new creation to employers. Q: Does it cost anything to be able to apply to positions? A: Yes. It's less than $1 per day to use the services. We're in the business of connecting golf employers to job candidates. We do all the hard work for you, so all you need to do is apply to the jobs. A truly nominal fee that your new job will cover the first day (or perhaps hour). Can you think of a better investment in yourself? Q: Can I apply to as many positions as I want? A: Yes. You can apply to every position on the job board search if you like. There are no limits to how many positions you can apply to. Q: What if I don't find the job I want? 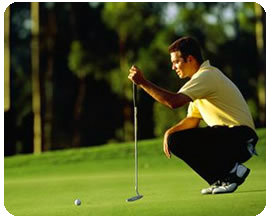 A: You can search the golf jobs for free before you ever register. There's really no risk to you at all. Even better, we have a golf industry directory of 33640 contacts in the golf industry, including golf businesses and facilities across the U.S., and you can contact all of them as a registered user. This alone is invaluable. Today, it is estimated that over 2 million people are directly connected to the golf industry in one way or another. They include club professionals, starters, pro-shop personnel, greens keepers, marketers of resort reservations and club manufacturers. There is a career opportunity for almost anyone who wants to work in the business. And the field is growing quickly each year. We have thousands of employers waiting for your resume, so Let's Do This! USGolfJobs.com provides you with everything you need to know, from researching the industry to accepting a position. Not only will you have every golf industry job available to you 24/7, you will also gain a competitive edge through our research and career advice, helping you obtain the job you want. We receive testimonials on a daily basis from current and past members. We have already done all of the work for you, now all you have to do is register.